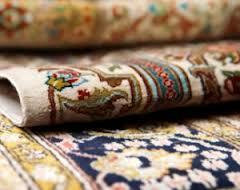 Revive the beauty of your fine Oriental rugs! Years of hidden dirt and dust build-up can prematurely age and dull your costly investment. Experts say that in order to prolong their beauty, Oriental rugs should be cleaned professionally at least once every two years. Single Source provides expert cleaning in our Warwick facility for all types of handmade rugs, including wool, silk, braided, and needlepoint. We use color stabilizers and a gentle cleaning process that includes hand washing with a non-toxic, environmentally safe shampoo created specifically for silks and wool. After your rug is cleaned, water is extracted and it is hung in a climate controlled dry room where low heat and dehumidified air allows it to dry without danger to natural fibers. Click here for our Oriental Rug Cleaning Price List.